Coordinates: 39° 56' 8" North, 116° 21' 35" East. The Zhengyuan Mosque is a functional Mosque situated in the Xinjiekou Area of the Xicheng District in Beijing. The Xinjiekou Area is situated within the north-west corner of the old city of Beijing, of which it was a ordinary residential part made up of irregularly arranged hutong alleys. Many of the Hutong alley's remain to this day and the Zhengyuan Mosque is situated among them. Interestingly and most notably, the particular alley where the Zhengyuan Mosque is located was also the location where China's Last Emperor (Aisin-Gioro) Pu Yi had his last known residence in Beijing. This modest home, where the last Qing Emperor and heir to the Dragon Throne spent his last few remaining years as a happily married man and ordinary citizen between June of 1962 and his death on October 17 of 1967AD, has however sadly been torn down some years ago, during the modernization drive that swept the city. The mosque is not mentioned in any publications relating to the last few years of the old Emperors life. Housed within an old style quadrangle courtyard and temple style building it is one of the lesser known and off the beaten path sites and locations in Beijing. As such is goes entirely unmentioned in any of the tour- and travel-guides dealing with the city of Beijing. The Zhengyuan or also Xinjiekou Mosque is situated near Guanyuan Park and also near The so called West City of the Beijing University of Economic Sciences. Go to the Zhengyuan Mosque for prayers or sightseeing whenever you find yourself in the area. With time to spare one might combine with a stroll through the surrounding hutong alleys, or make the walk up to the memorial Hall to Painter Xu Beihong which is situated in the same area, Xinjiekou, of the Xicheng District. Previously, the corner of the old city where Zhengyuan Mosque is located was an almost unreachable spot, except for those who really wanted to go there. Travel modes included a long hike from Xizhimen Subway & Train Station (Beijing North Station), or just a straight up taxi cab ride to get to the location. In just about 10 years time however, the complete situation for travelers making use of public transport within the city has entirely changed. No longer are long hikes or expensive rides needed. Today, the best mode of transport to take in order to get to the Zhengyuan Mosque and its surrounding Hutong is the subway/metro system. In this regard, there are two viable routes to take. 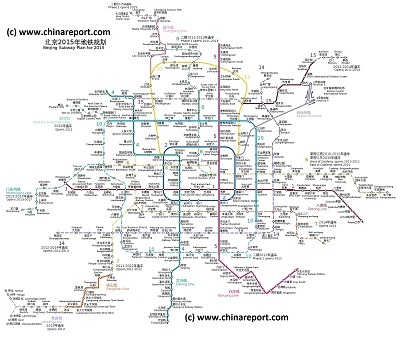 That is both, the Xinjiekou Subway Station and the Ping An Li lie at an equal distance to Dongguanying Hutong and the Zhengyuan Mosque. Additional options make for longer walks to your final destination. AsiaReport.com generated Google Map Overview of the location of Zhengyuan Mosque in the Hutong of the Xinjiekou Area of Xicheng District of Beijing. Satellite Imagery (see: Google Maps) reveals that it sits tucked away within the Hutong alleys found immediately south of the current day Xinjiekou Subway Station. The Mosque itself is a collection of traditional buildings set somewhat chaotically within their own surrounding walls. If one counts the smaller ones as well, the collection of structures counts six courtyards set in the traditional Chinese way, a north to south fashion. There are some 7 larger halls and a collection of subservient buildings but no minarets. A large and obviously old tree stands on the west side of what appears to be the central courtyard. The outer and southern gate of Zhengyuan Mosque is an entirely modern structure, as found elsewhere around China at modern day mosques, a mix of both Chinese and Islamic Features. Featured with Chinese inscription in blue glazed tiles above its red gate doors sided by Chinese style stone drums the gate is flanked by white tiled walls lined with green and decorated with blind Islamic style arched windows. Above all of it tower the Islamic Style domes of what is clearly a mosque and not a Buddhist or Taoist Temple. Satellite Image of Zhengyuan Mosque in the Hutong of the Xinjiekou Area of Xicheng District of Beijing. which is the main boulevard underneath which the station was constructed. It runs from the east to the (now torn down) Xizhimen Gate in the west. Take the direction east and walk eastward along Xizhimen Ineer Street, preferably along its south side. The next large intersection one encounters is with Dongxinkai Hutong leading northward and Zhaodengyu Road leading southward. At this intersection make sure to turn southward and keep to the western side of Zhaodengyu Road. The Dongguanying Hutong is the second alley on your right hand when walking southward along Zhaodengyu Road. Having located the entrance into the alley, simply head westward and look for the clearly identifyable South and Main Gate of the Mosque which stands on the north side of the alley. The route from Ping An Li Subway Station to the Zhenyuan Mosque is roughly of equal length but slightly more complicated to follow especially if one is unfamiliar with the neighborhood, as most expectedly are. Take Line 4 or 6 up to Ping An Li Station, then take a southern exit. From the Station follow the main boulevard of Xinjiekou South Street (Xinjiekou Nan Dajie) a short way down to the second next intersection, which is where Xinjiekou South Street meats the main east to west thoroughfare of Dainmen West Street. No need to cross Dianmen West Boulevard, just keep to the north side of this road and follow it westward to the next intersection. This next intersection is where Dianmen West Street Zhaodengyu Road (which leads up to Xinjiekou Subway Station) come in from the north. The only thing left to do is to cross to the west side and head northward into Zhaodengyu Road until meeting Dongguanying Hutong about halfway up the block on the west side of the road. As above follow the road until reaching its main gate.